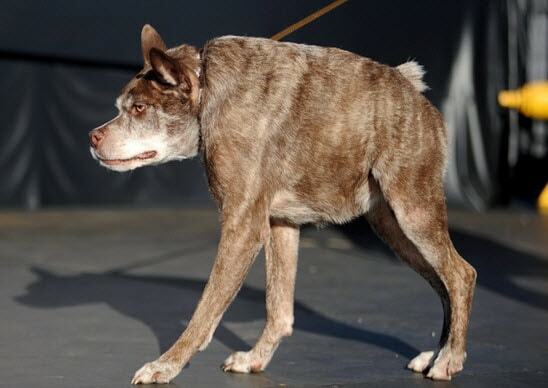 Every dog is beautiful in my eyes, however there exists a competition called ‘The World’s Ugliest Dog’, and this year the winner is Quasi Modo a Pit Bull and Dutch Shepherd mix dog, who came runner-up last year, and returned this year to take the crown. Quasi’s so called ugly features are due to a birth defect in his spine that led to dwarfism in his torso. He was adopted by a veterinarian from Loxahatchee, Fla, who admits he spoils him rotten. I think the spoiling is only going to get worse as Quasi Modo and his owner won $1,500 when they defeated 25 other “ugly” dogs. That’s a lot of dog treats! Congrats to Quasi Modo!